Corinthians hitman Dentinho could soon make a move to the English Premier League, with Manchester United and Arsenal said to be weighing up bids for the Brazilian forward. "They [Corinthians] want too much money for Dentinho, so the club who are willing to pay that kind of money will land the player. He is a great talent. Another great Brazilian talent. A very good technical player who is good on the ball. The fans will love him in England, the public will worship him. A little bit like Cristiano Ronaldo. He wants to play in the Premier League, it doesn't make a difference if it is Arsenal or Manchester United." The 20 year old, has enjoyed an immensely successful campaign with the Sao Paulo club, partnering Ronaldo up front and helping the club claim the Campeonato Paulista title earlier this year. A dangerous striker, Dentinho is good both in the penalty area and when he cuts in from the wings. Composed in front of goal and skillful in the build up play, he has a lot of ability already and will certainly improve; a move to the Premier League will only enhance his prodigious talent. Bruno Ferreira Bonfim, or simply Dentinho was born January 19, 1989 in Sao Paulo. 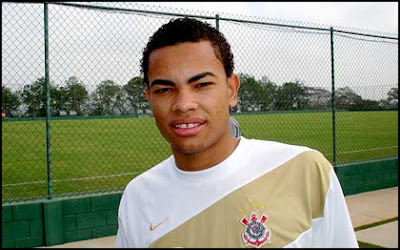 In 2007 after being promoted from the youth team he made his first appearance for Corinthians in the Brazilian League in the derby game against Palmeiras, and scored his first goal in a draw against Fluminense. 2008 saw him become Corinthians top scorer during the Campeonato Paulista 2008. Also was the team top scorer(alongside wirh player Herrera) with 14 goals during the championship campaign Campeonato Brasileiro Série B 2008. This year the player put in very good performances and lead team to the title alongside new Corinthians signing Ronaldo during the Campeonato Paulista 2009.